Ms. Sarah Roof, a lifelong member of Daniels Lutheran Church in Lincolnton, NC was a lady that was very interested in Home and Foreign Missions. Upon her death, her estate established the “Roof Mission Endowment Fund” which is administered through Daniels Lutheran Church. Her instructions were to divide the proceeds from the endowment with half going to Foreign Missions and half to Home Missions. Therefore, in July 2017, a gift of $10,000 was given to the North Carolina Lutheran Men in Mission Loan and Gift Fund and the Home Mission Foundation. A gift of $10,000 was also given to Foreign Missions through the North Carolina Lutheran Synod. Miss Sara was very active in the life and ministries of Daniels for over 90 years. She supported charitable causes within the community and church. Her legacy will live on through her generous gift. 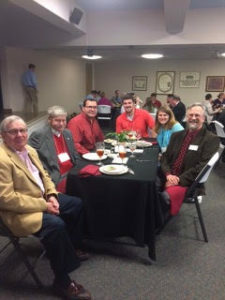 John Fisher, President of the Home Mission Foundation and Terry Edwards, Men’s Ministry Coordinator, North Carolina Lutheran Men in Mission attended the LTSS Annual Scholarship Luncheon on Wednesday, February 15, 2017. The annual luncheon honors scholarship donors and student recipients. John and Terry were there to represent the Home Mission Foundation and NCLMM. They were honored to be seated with senior seminarians, Brandon Heavner, Daniel Locke and Sarah Locke. Also seated with them was Dr Brian Peterson, Professor of New Testament, Bible, and Mission, which is the endowed chair established by the NCLMM and HMF. Mary Lou Seagle Cline was a kind, humble and caring Christian lady who lived on the Seagle family farm in Vale, and was a lifelong member of Daniels Lutheran Church. She passed away last August at age 95. She had been married to Ira Cline, a well-known Lincoln County citizen who predeceased her. I had the privilege of serving as executor of her estate, and I just want the community to know of her kindness and generosity. Cline, through her will, gave significant monetary donations to Daniels Lutheran Church, Pleasant Grove Methodist Church (Ira Cline’s church), Christian Ministry of Lincoln County, Habitat for Humanity, Hospice, United Way, the Historical Society, Red Cross, Lutheran Brotherhood, Baptist World Hunger Fund, Cancer Fund and Heart Fund. Most of these funds will benefit Lincoln County citizens directly, and for that we are most appreciative, and we want to remember Mrs. Cline, and also her like-minded generous brother, Paul Seagle, who predeceased her. For more information about Planned Giving through the Home Mission Foundation, please visit our “Planned Giving” page at this link. 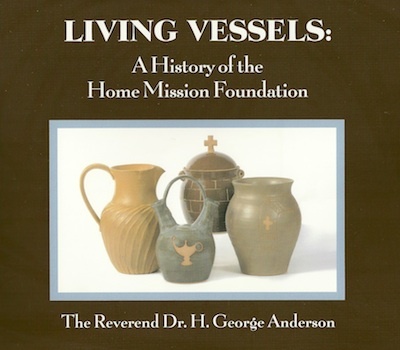 Living Vessels: A History of the Home Mission Foundation, written by the Reverend Dr. H. George Anderson, has been published and is now available. Please click on the “Contact” tab to request information on the distribution of this book.